My mom was a cake decorator and she had hundreds of Wilton baking pans, when I was a kid growing up she would do cakes of all creations, from birthdays to wedding cakes and me I loved licking the beeters, I use her same pans and tips today, memories. Community Supported Agriculture is offered as a Wellness benefit at work. 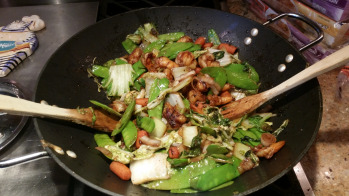 Took advantage of the week’s offerings to create a shrimp stir fry on-the-fly: snow peas, bok choy, chinese cabbage, carrots, shrimp & some sesame oil, served over brown rice! Since I work full-time, this was my way of letting them know that I am thinking of them during lunchtime. 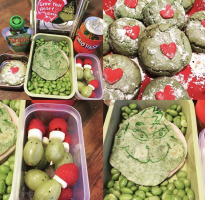 Every other week I would prepare and make a themed lunch- based on a recent musical, ball game, or movie that we have experienced together. I like to bake at night. It is cooler and everyone is asleep so I can have the whole kitchen to myself, to bake, mess up and make sure it is clean in the morning. 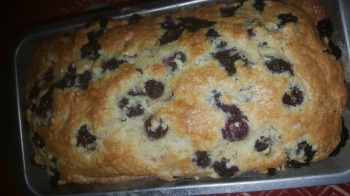 Fruit breads are one of my favorites. This is blueberry loaf! This reminds me of all the great times we had as a family together! We love to gather in the kitchen...but in recent years we admit our cooking is not as good as it once was! 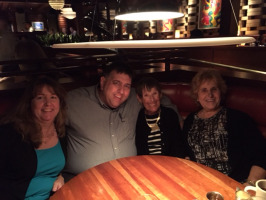 We enjoy the company and sharing those special moments together! I love a sleek and modern look to all of my appliances. 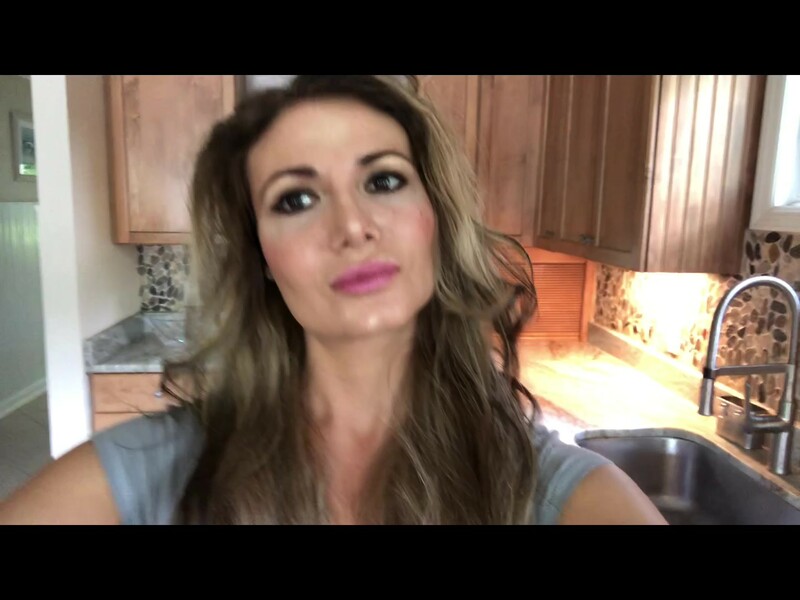 The feeling of baking my fresh cookies and breads, cakes and brownies in appliances that are easy to clean and look chic. 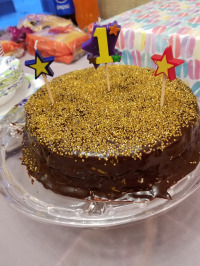 It makes baking my daughters 1st B-Day cake, a pleasure! Everyone found a reason to be in the kitchen when my grandmother was cooking. 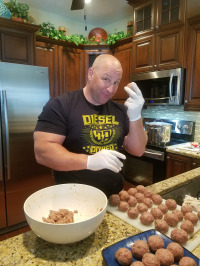 Especially when she made her meatballs! She brought us all together to cook, laugh, eat, enjoy. And we still do to this day. I savor the flavor of togetherness! Bringing my 4 little girls in the kitchen makes for more than just smores. We build memories and delicious treats. 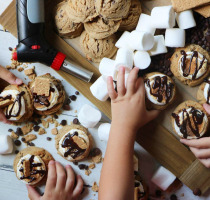 Attention to details and beautiful toppings make smore cookies irresistible. Our kitchen is the heart of our home. It's where we create food and experiences culminating in life long memories. Friends and neighbors gather as strangers and leave as family. The details allow us to savor the moments that feed our heart and soul. Decadent chocolate covered strawberries can playfully amuse the whole family. Get inspired with toppings & No need to melt with a double-boiler when you have a Bosch microwave. Make sure the berries are dry before the dip and Pop some bubbly Cheers!! I love baking. 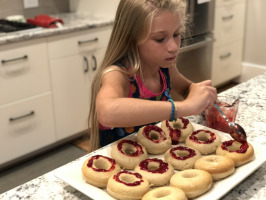 I love baking more when my kids come and help me. 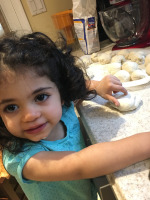 Recently my neice joined in and is now one of my favorite sous chef! I love baking desserts and whoopie pies are one of my favorites. 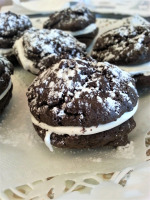 I found this recipe on the internet for a lower calorie chocolate whoopie pie and they were a BIG hit with everyone. This is a favorite moment in time. 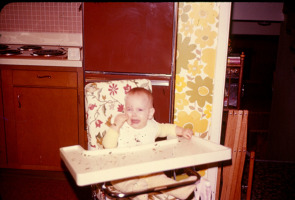 Now this baby is 44 years old and we both love Bosch Appliances for their quality and timeless colors, unlike the brown appliances of the 70's which look very dated. I love to surprise my friends with cakes, cookies, or other special treats for their birthdays. 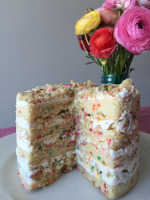 The Milk Bar birthday cake in this picture was a treat for a co-worker who had visited Milk Bar on a trip New York. Growing up we celebrated the 4th with John Philip Sousa marches & Red Velvet Cake. 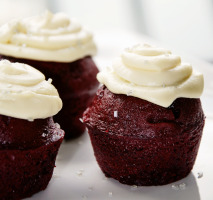 I'm a cupcake girl & still use my mom's rich & delicious cake recipe, but the mascarpone frosting is all me. Sousa would march all the way to my house for 1 of these! 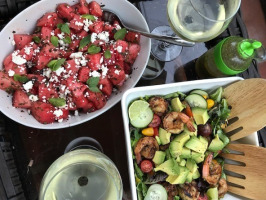 I love this time of year because it allows you to enjoy the fruits of your labor in the kitchen, outdoors. My happy place is in the kitchen. 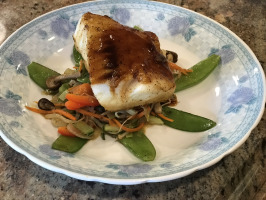 It's allows me to be creative, relax and enjoy eating a thoughtful meal with a party of 2 or 20. 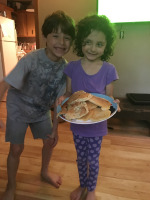 With supervision from mom, my kids five and seven made pancakes by them selves for the first time. 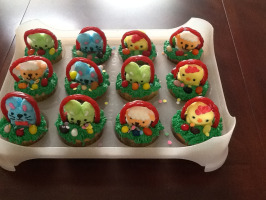 I’m looking forward to teaching them to create all sorts of wonderful treats. 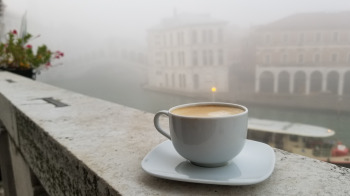 An amazing and favorite moment was enjoying an espresso on a balcony overlooking the Grand Canal and the Rialto Bridge in Venice, Italy. A culinary experience through the eyes of a toddler. 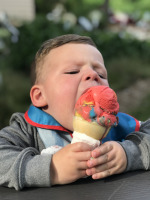 Every kid tries superman ice cream for the first time. Aaron is digging it! Shrimp and Grits is a favorite in our multicultural kitchen! 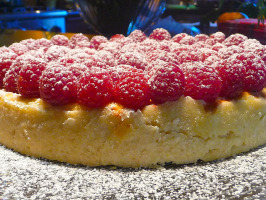 I’ve always been afraid of making complicated desserts because of the expense of ingredients in case my attempt was a “failure”. 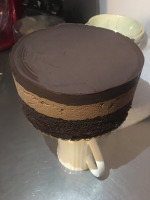 But I put caution to the wind and on a whim decided to tackle a triple chocolate mousse cake, I nailed it! 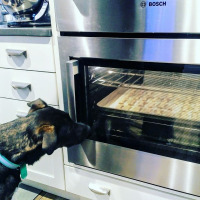 Everyday in December leading up to Christmas I have treats baking in my amazing Bosch double ovens. The most important item that is baked is dog bones. My chief monitor and tester is Kona! She keeps a close eye on them. © BSH Home Appliances Corporation.